Mitered square is one technique of knitting, I am totally in love with. The process is simple, yet it gives a beautiful textured end product. 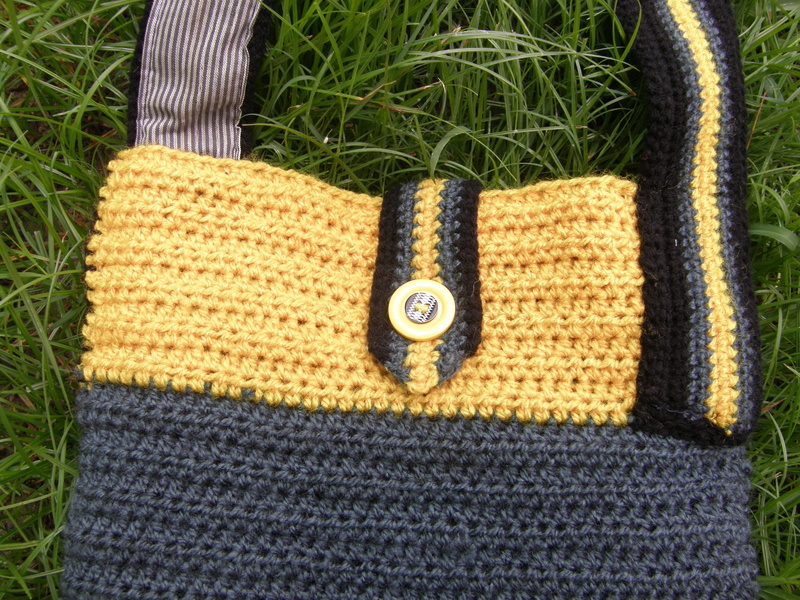 Simple stitch variations and change in colours give a totally new and different look. Knitting a set of cushion covers was a long pending item in my to-do list. Finally this year, I decided that I must start knitting them. I also decided that, I’ll try out different variations of the same theme/ technique viz. 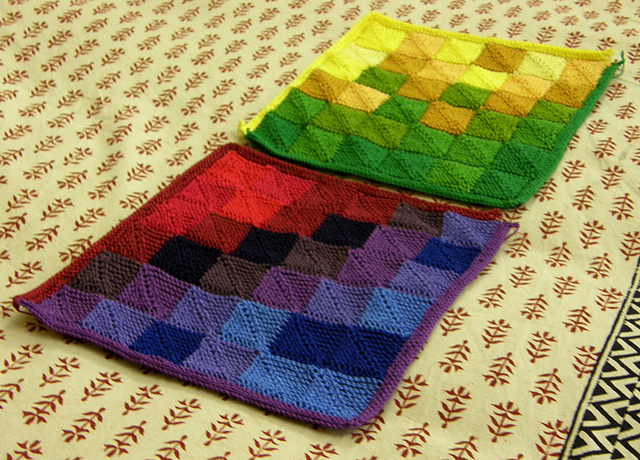 mitered square by changing colours and stitch combinations. These are the first two, in my set of twelve 12’ x 12’ cushion covers. 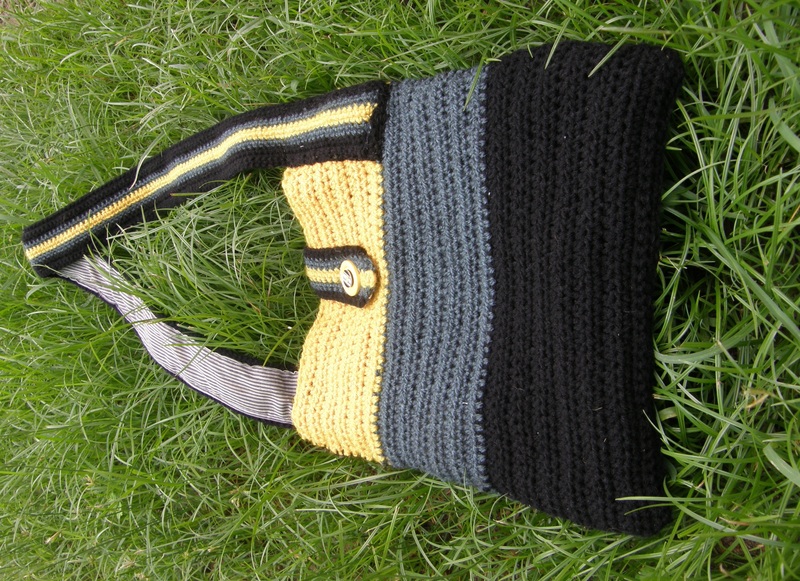 You can see all the photos and know more about it, in my Ravelry page Field of colours. Being sewing-challenged, I have decided to attach these on pre-sewn covers. But you can either knit a garter or stockinette stitch back and join this front piece with that or attach this to a fabric back. A number of friends asked me to write down the pattern. As always, this again is a recipe, which can be modified and made into different variations and the change of colours would also make a difference in look of the finished product. The basic pattern has always been there and used in many beautiful projects. So now on to the recipe. 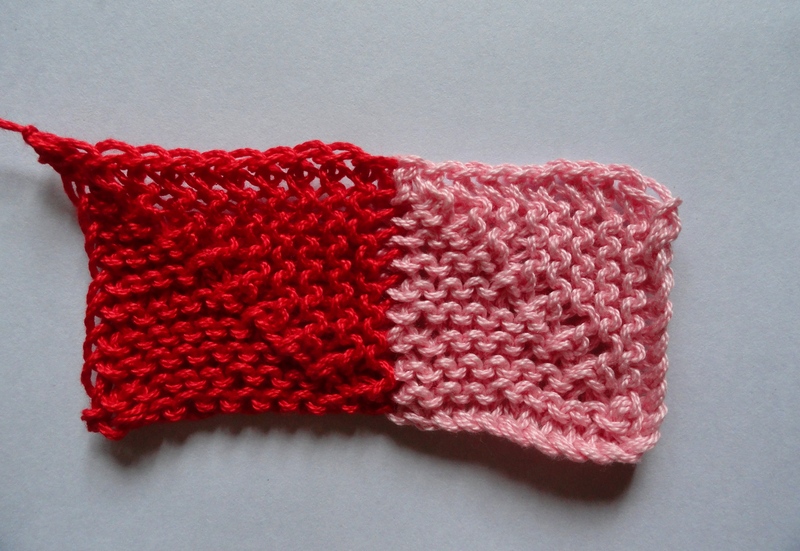 This can be made with any yarn of any weight, only the size of the unit square will change. 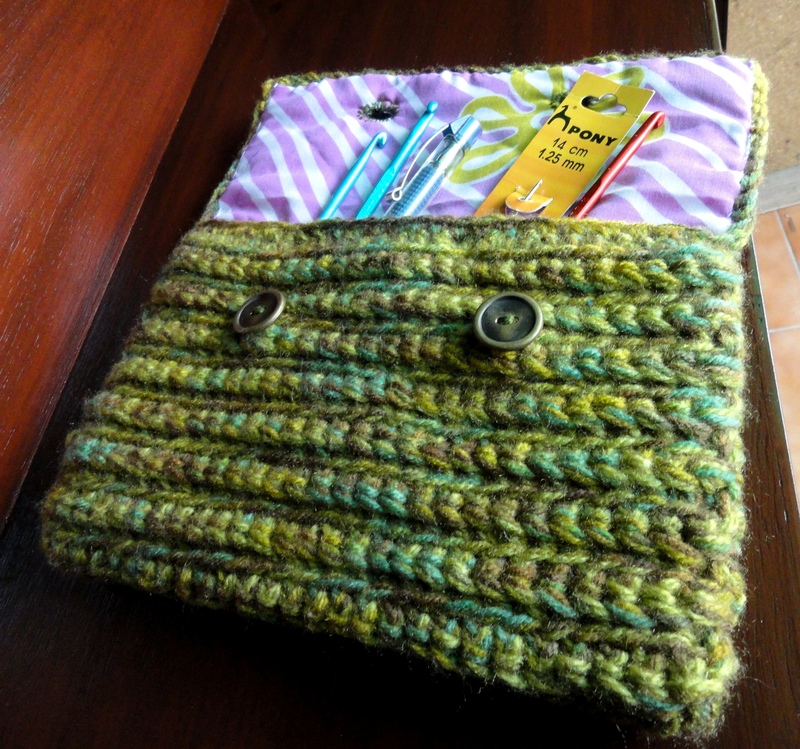 In fact this can be one the lovely uses for the left over stash. 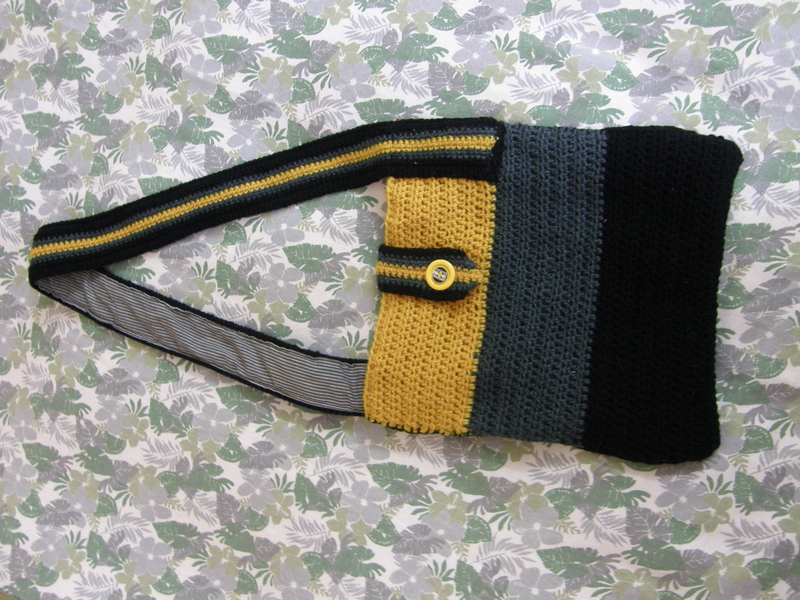 I used Anchor Knitting Cotton in various shades for this. You can make it monochrome or colours arranged in any variation of your choice. I used about 68 gms of this yarn for a 11.5 x 11.5 square. Use suitable size of needle for the yarn you plan to use, ensuring that the resultant fabric is firm and not hole-y. I used 3.25 mm needles for this. Unimportant as long as you get a firm fabric. 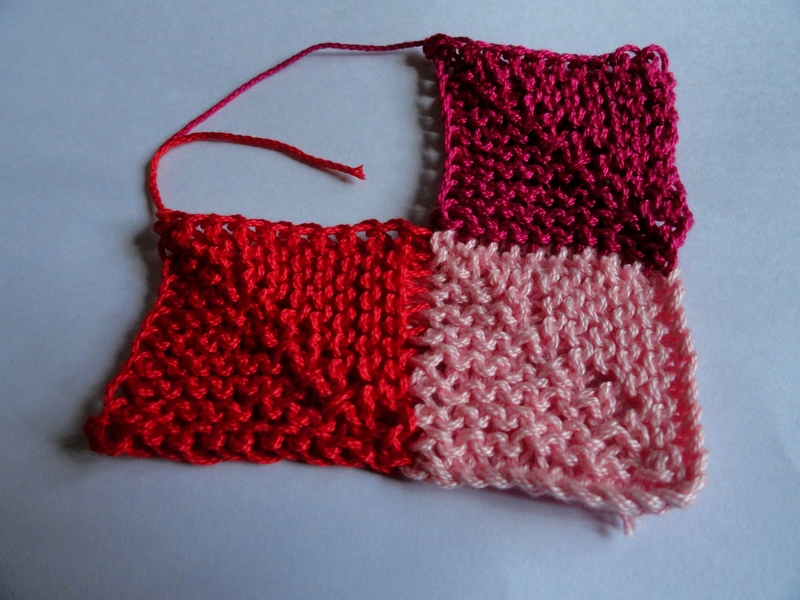 CO any odd number of stitches (depending upon the size of square you want), with your favoured method of casting. 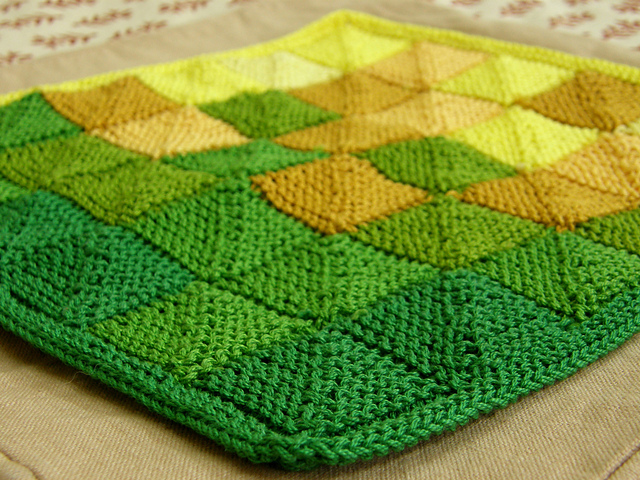 I CO 21 stitches since I wanted smallish squares , it gave me a 1.5 x 1.5” square. 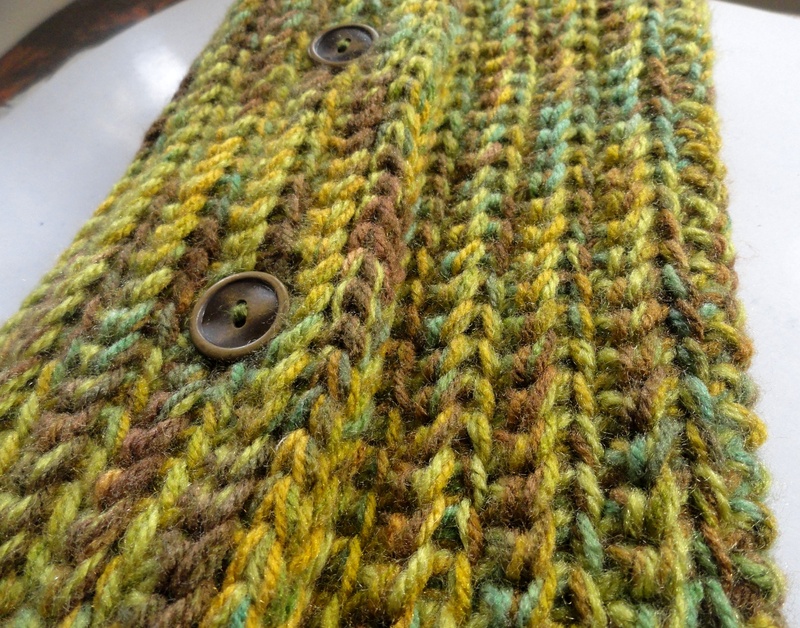 Slip the first stitch of every after Row 1 purl-wise, take yarn to the backside of the work then proceed to work. 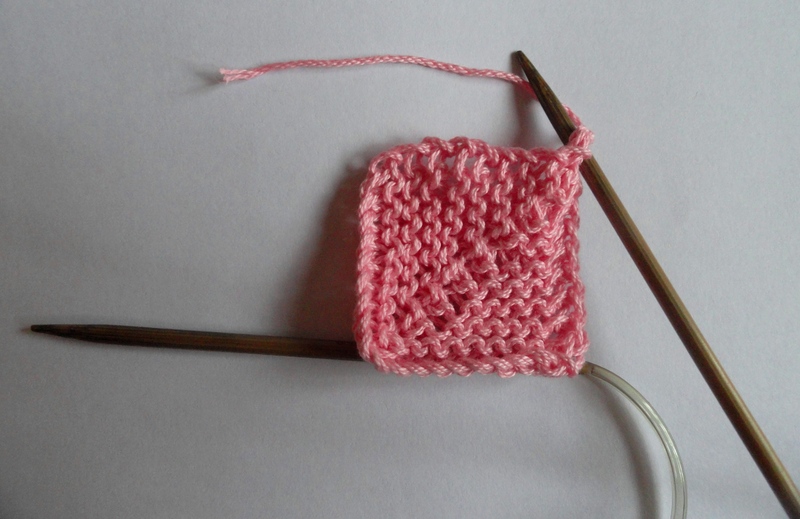 This gives a series of chains at the edge, which helps you to pick up the stitches for the next square more easily. Continue this way till you have 3 sts on needle. Fasten off leaving 2” of tail. You are done with the first square. It may not look exactly a square at this stage but will become alright once you add the following squares. 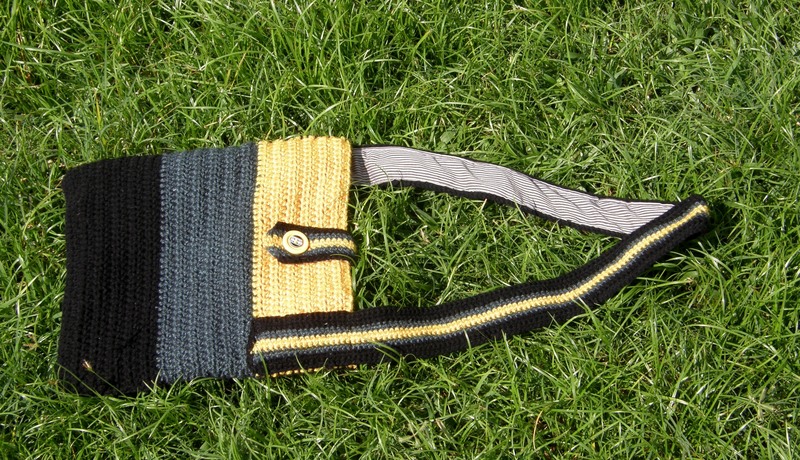 With a new yarn of a colour of your choice, pick up 10 stitches starting at end where you fastened off the first square. 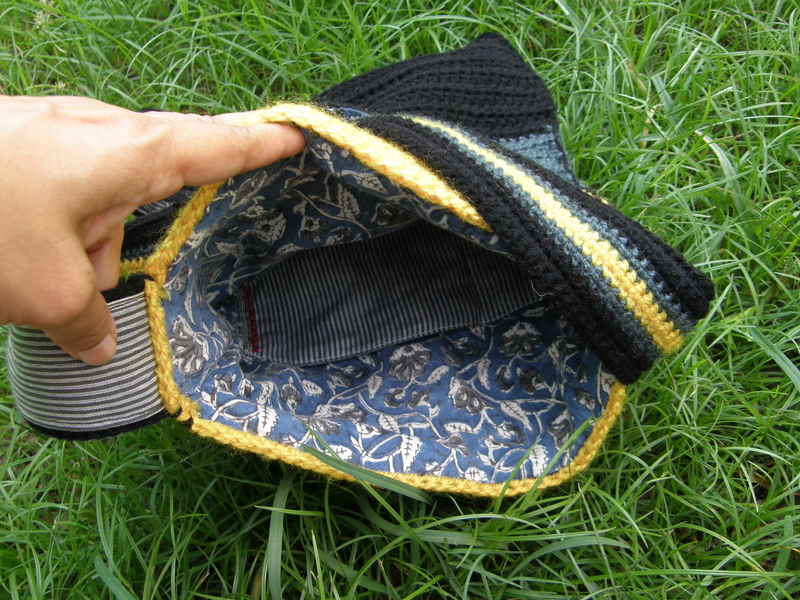 You’ll pick up one stitch at every chain formed at the edge (take both loops of the chain to pick up the stitch). 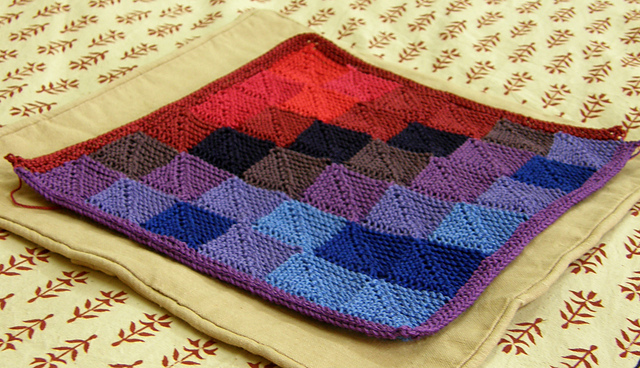 Pick up the 11th stitch at the corner of the edge of the square. CO 10 stitch by provisional CO method. Now you have 21 stitches on your needles again. 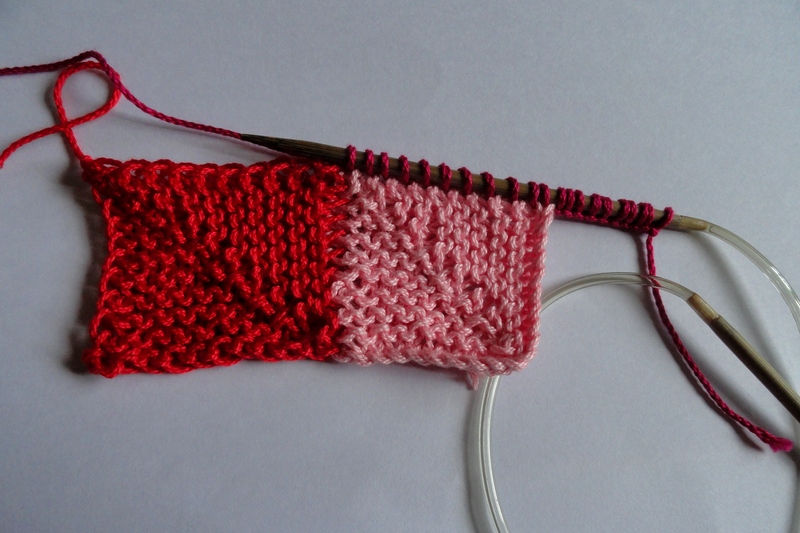 It might look a little wonky on the needles at this stage but as you progress that will straighten out. Follow the instructions as in the first square from Row 1 till end. So your second square is ready. 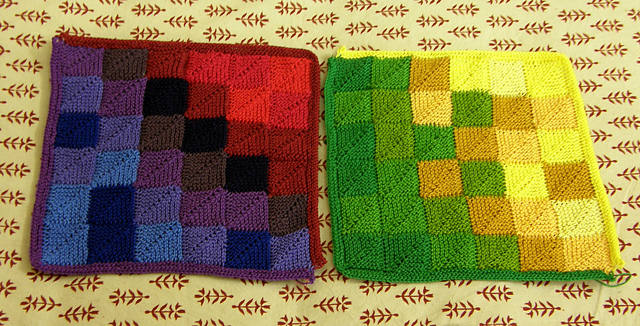 Pick up the 11th stitch at the top right hand side end of the first square (it will be the other end across where you picked up the first stitch for the second square). 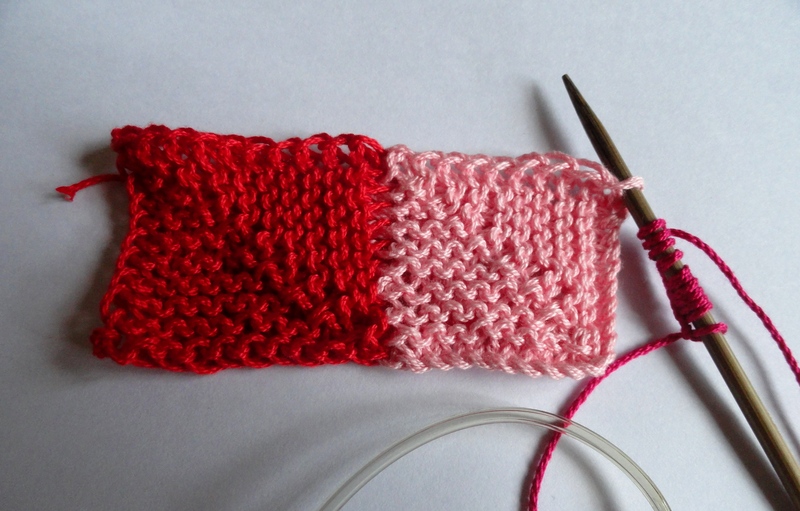 Pick up 10 stitches along the top edge of the first square. You have 21 stitches on your needles. Follow the instructions as in the First square from Row 1. And now you have your three squares ready! 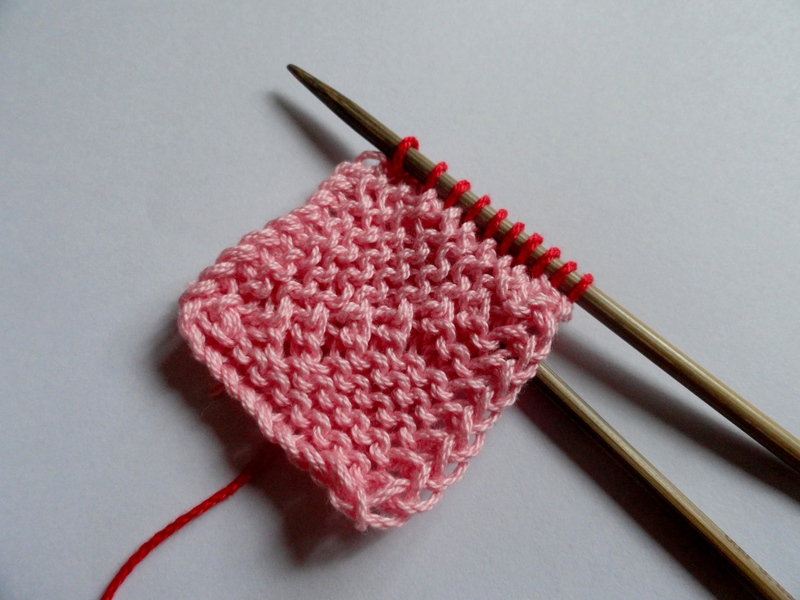 Knit in the ends while picking up stitches for the following row or weave in the ends later. Now you know how to add on squares side by side in rows and columns. Here all the central double decreases will fall in the same direction. 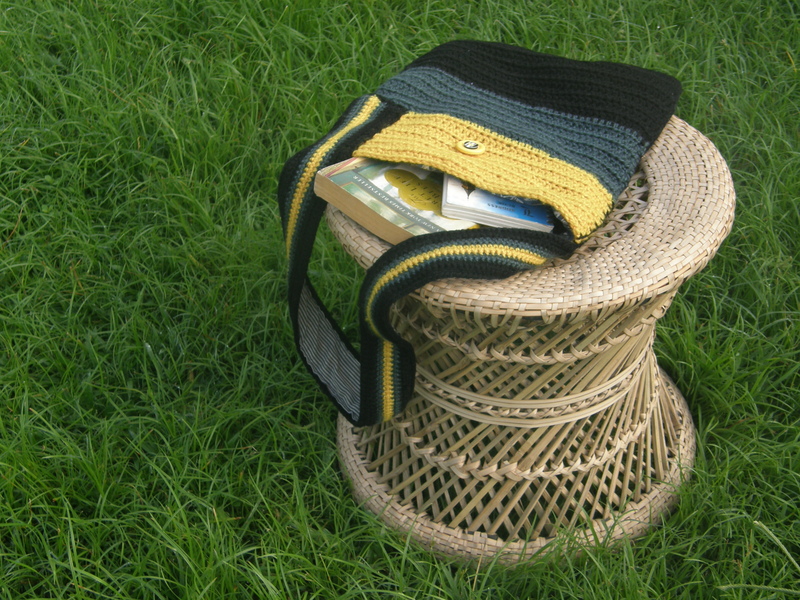 I knitted a narrow border in garter stitch around the final piece. I do not know whether the process is clear or not. In case, it is not or you notice some error, please feel free to let me know. There are any number of possibilities in arranging colours to get different shapes and looks. 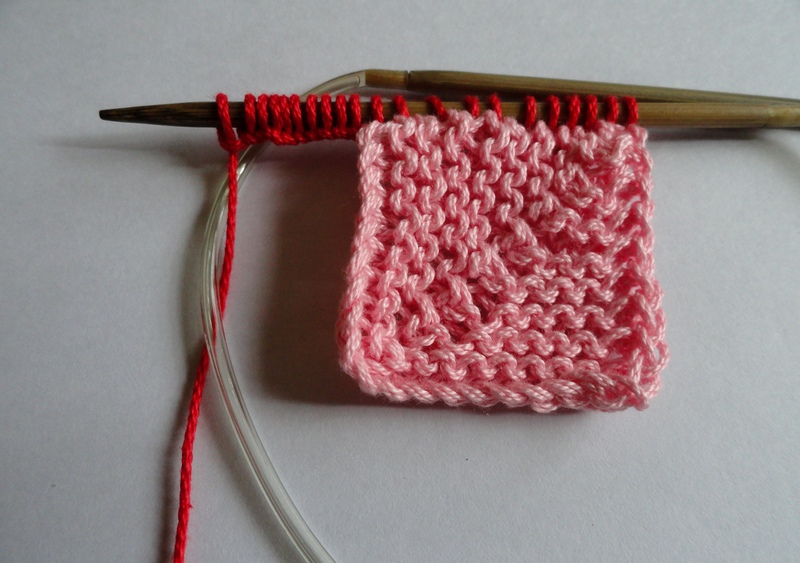 Depending upon the size of square you desire to have you can increase the number of stitches by multiples of two. Your number of rows will increase accordingly. I look forward to see the pretty and colourful projects coming up. In case you happen to follow this and make your Mitered Square project, I hope you do not forget to give credit to this post/mention this post as your source of direction or inspiration.